I love bananas. I love chocolate. I love cooking with bananas because they make this awesome crusty-golden beauty that tastes as good as it looks. I also love muffins. What’s not to love? Bread with fruit and chocolate. I can totally get behind that! 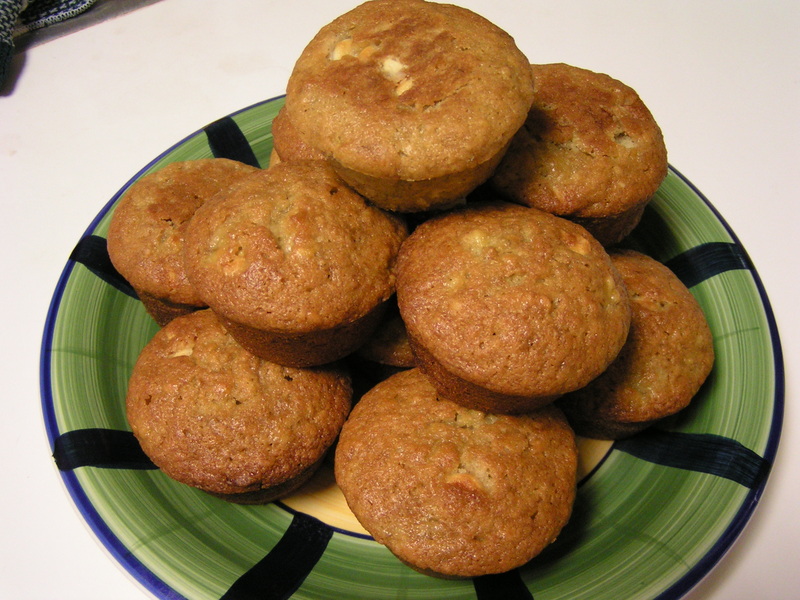 Side bonus…muffins are WAY easier to make than cake. Plus, it’s like having a tiny cake of your own with every muffin! Preheat the oven to 350F. Spray the muffin pan with non-stick. Whisk together 1 3/4 cup flour, 1/2 cup granulated sugar, 1/4 cup brown sugar, 1 tsp baking powder, 1/2 tsp baking soda, and 1/4 tsp salt. Mash 3-4 meduim to large bananas, and combine with 1/2 cup melted and cooled butter, 2 large beaten eggs, and 1 tsp vanilla extract. Fold the wet mixture into the dry, using the well technique, stirring until just combined. Add 1/2 cup white chocolate chips, and spoon the mixture into the prepared muffin tin. Bake 20-25 minutes. I used 4 bananas, and needed to add about 3 tbsp flour to stiffen the batter. Also, the recipe made about 16 muffins. My muffin tin has 12 cups. On the last 4 muffins, I used the center row and filled the empty cups with water, so the muffins would bake evenly. Cool in the pan about 5 minutes, then complete cooling on a wire rack so the sides and bottoms don’t sog out! Then eat. Might need to hide a few…these went FAST!!! Oh, boy were those GOOOOOOOOOOOOOD!!!!!!!!! Next time, make a mini loaf with the leftover batter. Or double the recipe and do a full loaf. I have bananas that should be ready tomorrow… can’t wait!